Spider plants (Chlorophytum comosum) are another commonly grown houseplant. They make excellent additions to hanging baskets with their long, ribbon-like foliage and arching stems of spiderettes spilling over the edges. To keep these plants looking their best, it is occasionally necessary to trim spider plant leaves and spiderettes. When given the proper growing conditions, spider plants can reach 2 ½ to 3 feet in both diameter and length. As a result, spider plants benefit from an occasional pruning. This is normally done during spring, or in most cases, summer. Pruning spider plants keeps them at a more desirable and manageable size and rejuvenates their overall health and vigor. In addition, the more babies it produces, the more the plant needs fertilizer and water as this uses up much of its energy. Therefore, the spiderettes should be removed as well. These can then be placed in moist soil or water to make additional plants, which root within a few weeks. Any foliage being pruned should be cut at the base of the plant. Always use sharp pruners or scissors when pruning spider plants. Remove all discolored, diseased, or dead foliage as needed. To remove the spiderettes, cut the long stems back to the base from both the mother plant and the baby. For overgrown or pot bound plants, repotting in addition to pruning may be necessary. After pruning, repot the spider plant, giving it a good root pruning as well prior to returning it to the pot of fresh soil. Generally, it’s a good idea to include root pruning at least once every year or two. Occasionally, you may notice brown tips on your spider plants. Oftentimes this is due to the type of water being used during irrigation. For example, city water often contains chemicals such as chlorine or fluoride that can be hard on plants. Over time these chemicals will build up in the foliage, eventually burning the tips and subsequently turning them brown. For this reason, it’s better to use distilled water (or rainwater) whenever possible. You could also choose to leave some water sitting out overnight to lessen the chemical effects. Brown tips can also occur from too much sunlight and low humidity. 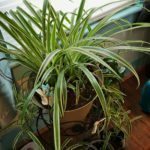 Keep spider plants out of direct light and mist the plants when the humidity is low. Remove any leaves that have brown tips as well as any that may be yellowing.